Divine Divinity takes place in a fantasy world and offers a single player RPG experience. The game promises an impressive story based experience for players to follow. The setting for the game is a dark fantasy world and has players getting caught in the middle of a battle between good and evil. Your journey will take you to all corners of the game world in a story and exploration driven campaign with plenty of combat and character growth along the way. Divine Divinity is played from a top down perspective with character movement being heavily driven by the mouse which is similar to other games in the genre. Divine Divinity also features random loot and a diverse range of skills allowing players to pursue their own style of gameplay. Divine Divinity gives players a choice of 3 different classes to choose from although because every class has access to every skill in the game this choice is more about starting stats, starting skills, stat growth and their special ability. One of the most enjoyable features of the game is the interaction that players have with the game world. Instead of simply searching through barrels players can move them around or even create a bed out of straw that they find on the various farms. While a small touch this feature adds a lot to the engagement level that players have with the world. 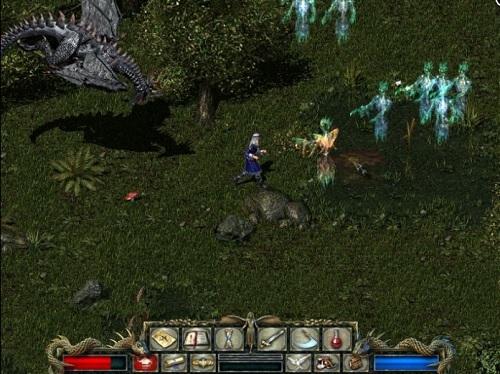 Divine Divinity is part of the many popular and successful action role playing games that released around the year 2000 off of the success of the Diablo series. While there were plenty of dud games released in this time Divine Divinity definitely wasn’t one of them. Impressive dark fantasy world to explore. Random loot system to make every item drop a fun one. 3 different classes to choose from each with a special move and varied character growth. Plenty of skill depth which each class has access to.